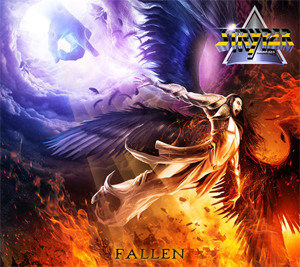 STRYPER's new album, Fallen, will be released on October 16th. The band has revealed the new album's artwork and the first song from the album, "Yahweh", will be released next week. "The album was written and arranged very quickly (9-10 days actually). This by no means reflects on the quality of the album. It's some of our best material to date and so far those who have heard it have said the very same. Chris Jericho texted me and said that “Yahweh” may be the best song since reuniting. Kevin (our publicist) said that the ballad is our new “Honestly”!